The Torit PowerCore CP Series dust collector is an extremely small but powerful package that handles high airflow, high grain loading, challenging particulate, and fits into the smallest places. The Torit PowerCore dust collector comes in two models: the CPC (stand alone dust collector) is up to 50% smaller than the traditional baghouse and can be ducted to many different applications. The CPV (bin vent) is up 70% smaller than the traditional bag bin vent and can be used on silos, conveyor transfer points, conveyor discharges, blenders and mixers. The Torit PowerCore VH Series dust collector brings the performance and simplicity of PowerCore technology to the mining and metalworking markets. Available for indoor and outdoor applications from 5,000 to 50,000 cfm, the VH series is specially designed to meet the requirements of heavy and abrasive dust loads found in grinding, blasting, crushing, screening, mixing, blending and other material handling. The PowerCore VH Series dust collector is an investment that keeps paying off the longer you use it. The PowerCore VL Series brings the performance and simplicity of PowerCore technology to light and fibrous dust applications. Available for indoor and outdoor applications from 5,000 to 34,000 cfm, the VL Series is specially designed to handle light and fibrous dusts. Ambient Air Tubesheet is a unique filtration unit designed to be a pre-filter in existing or built-up air handling and HVAC systems. AA Tubesheets offer excellent alternatives in industrial environments where ambient dust loading is too high for standard HVAC panel-type filters. Bin Vent applies cartridge dust collector technology to continuous-duty, bin venting applications. It is typically used to vent displaced air and harmful products in bins or silos. The Bin Vent is compact in design, easy to install, eliminates ductwork and reduces installation expense. Downdraft Bench is a self-contained dust collector used in grinding and finishing operations. The Downdraft Bench uses Fibra-Web® FR filter cartridges featuring nanofiber technology, provide higher filtration efficiency and long filter life. Oval cartridge dust and fume collector now sets the standard for industrial dust collection – by providing a 25% increase in airflow capacity, improved airflow path, and a 29% increase in pulse cleaning pressure. These compact, high-efficiency units use high efficiency oval-shaped cartridge filters, especially well-suited for filtering the sub-micron dust. There are 26 Downflo Oval cartridge dust collectors models including 3 self-contained, “plug and play” units: DFO 1-1, DFO 2-2, and DFO 3-3. 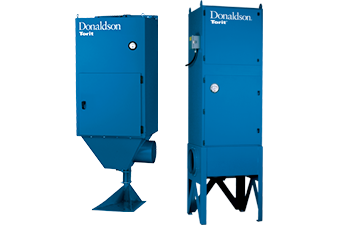 TD is a continuous-duty style cartridge dust and fume collector using pulse-jet technology for on-line filter cleaning. TD collectors offer efficient filtration for applications ranging in size from 300 – 2000 cfm. TD often need only 75% of the headroom other collectors need, and are easy to operate and maintain. Vibra Shake is a self-cleaning collector for intermittent applications where high collection efficiency is essential, such as reclaiming precious metals. The VS contains a two-stage cartridge for high-efficiency filtration on both coarse and fine dusts. Its compact, self-contained collector design allows placement flexibility and saves floor space and ships preassembled for easy, low-cost installation without need for compressed air. We put decades of industry experience to work to produce a new, best-in-class dust collector capable of reducing equipment size and number of required filters by up to 40% compared to a typical cartridge collector. A smaller collector helps lower the initial purchase price, reduces filter replacement costs, and opens up valuable manufacturing floor space. Dalamatic dust collector is an automatic reverse-jet fabric filter dust collector. It is most suitable for continuous process applications involving heavy-duty product recovery, or collection of large concentrations of nuisance dust, where high collection efficiencies are required. The Dalamatic baghouse dust collector comes in two models: the Dalamatic Cased is a stand alone bag collector and Dalamatic Insertable is a versatile bag collector that can be inserted into various applications, such as bins, silos, bunkers or transfer points. DB-800 Downdraft bench is compact and ergonomically designed for finishing small parts. It combines a heavy gauge, welded cabinet and direct drive fan to provide years of trouble free service. Hinged side panels allow for longer than normal work pieces. Modular Baghouse dust collector is a simple, reliable dust collector. Modular Baghouse dust collectors are designed to ship in major assemblies and load onto standard trucks with double drop trailer beds. This facilitates rapid field installation and limits crane time. The Modular Baghouse dust collector is designed to handle applications where high air volumes with heavy dust loading are the norm. IRD dust collector is designed to use a downflow air pattern and gravity to clean dust trapped on the inner surface of the filter bags and to force the dust into the disposal bags at the bottom of the collector. This unique design means that expensive compressed air is not needed in the operation of the IRD dust collector. Reliable and economical solutions to in-plant dust and smoke problems with an efficient, compact design that handles a wide range of dust applications from 1200 to 2000 cfm. LP Baghouse dust collector provides excellent performance in a reverse air design. The LP cleaning arm has a flow-stop plate that keeps air from flowing through the filter bags before and after they are cleaned resulting in superior bag cleaning. This unique system design reduces your maintenance cost and downtime. FT Pulse Jet Baghouse dust collector provides an easy and dependable operation for high-volume dust collection applications. This unique cleaning system minimizes moisture and particulate issues in pulse valves. The clean side bag removal provides easier filter bag service. The FT bag collector comes in two models: FTD is without walk-in plenum and the FTP is with walk-in-plenum. Centrifugal is compact, direct machine-mountable mist collector designed to collect, filter, and reclaim mist generated from machines using oil-based, synthetic, semi-synthetic, or water-soluble coolants. Mini-Mist is designed for CNC machining, grinding, turning, milling and drilling operations. It is used to collect coolant mists such as oil, water-soluble and synthetic coolant mists. The Mini-Mist design is compact and available in two models; MM 500 for light-duty operations and MM 1200 for machines requiring higher airflow or applications that require a mist and smoke collector. Modular MediaFilterTM Horizontal mist and smoke collector provides flexible, high performance mist collection for a wide variety of applications including grinding, wet machining, rubber machining, die casting, wet grinding or soldering. The Modular MediaFilter Horizontal mist collector system adapts to changing needs such as smoke, dust and fume filtration, saving the cost of a new filtration system. Whether you require horizontal or vertical configuration, we can design and supply a mist collector system to meet your needs. WSO mist collector is the only collector that filters three types of mist (water, smoke, oil) in one collector - simply by changing the mist filter. It was designed to collect water-soluble coolant, straight oil, and the most challenging, oily smoke from a variety of machining operations and other industrial processes. The WSO mist collector design has several configurations such as machine mountable, single machine stand mount, ducted cellular- and central system to meet your plant mist collection requirements. ​Mechanical separator using centrifugal force to remove large and high-volume dust from industrial applications. 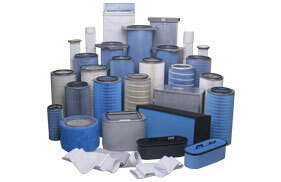 - An economical solution to a wide range of dust collection problems. Excellent for high dust load, high temperature, and product recovery applications. - Can be used alone, with optional bag filter assembly, or as a pre-cleaner. - Applications from 300 to 13,000 cfm. - Heavy-duty construction for long life and low maintenance. - Meets seismic zone 4 and 100 mph wind load ratings. - Removable cone section for easy replacement. The live bottom hopper is a trough and auger combination that attaches to the hopper of a dust collector to break up agglomerative dust. The dust is then sent to an included rotary valve which drops the dust out of the system while keeping the system air tight. 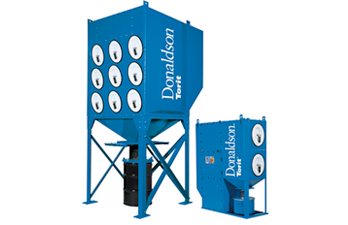 Kidde Fire Systems, a global leader in fire protection, and Donaldson have partnered to define fire suppression packages for many standard Donaldson Torit Collectors.